Following on from our last ROCCAT Review on the Kiro, today we will be taking a look at their Ryos MK FX Mechanical Keyboard. Some may still deny the benefits of using a mechanical keyboard over a cheaper more standard membrane keyboard, but one thing you can’t deny is the impact that mechanical keyboards are having on the gaming community. 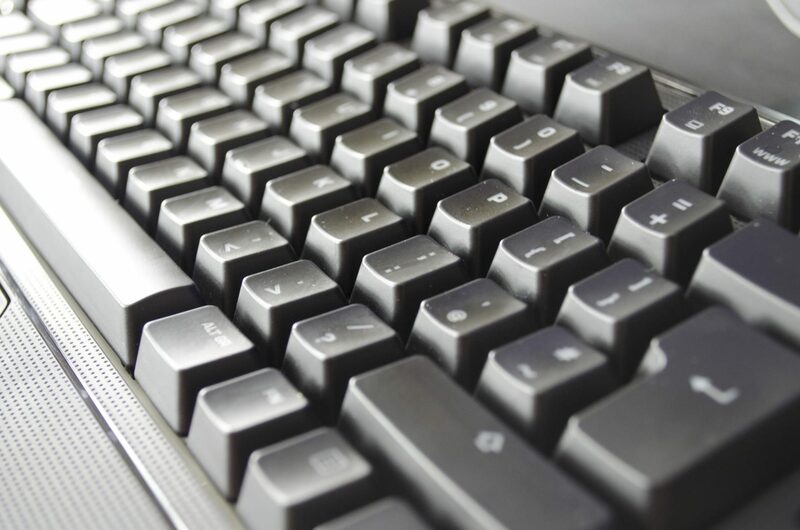 Mechanical keyboards come in many different ‘flavours’, some of which are thanks to the fact there are different types of mechanical switches out there. Not only are their different manufacturers, but there are also different colour switches which have different actuation points and features. While I won’t go into all the details at the moment, there are loads of options out there to consider if looking for a new keyboard. 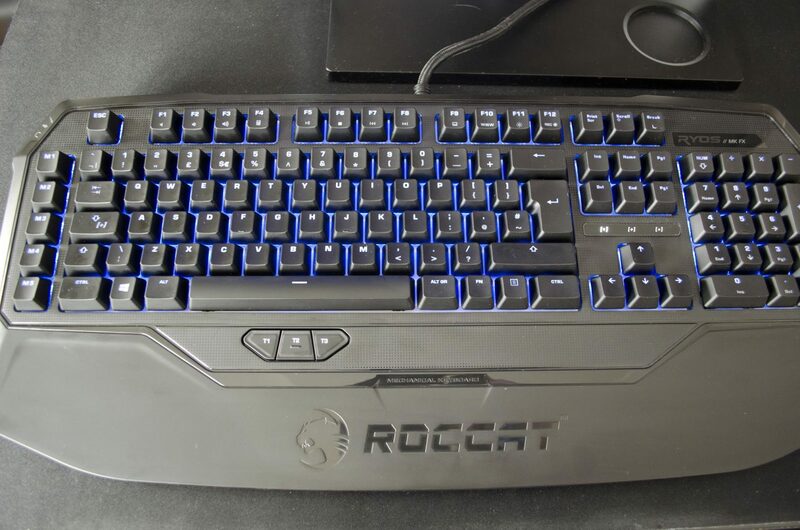 As mentioned, up for review today is the Ryos MK FX Mechanical keyboard from ROCCAT. 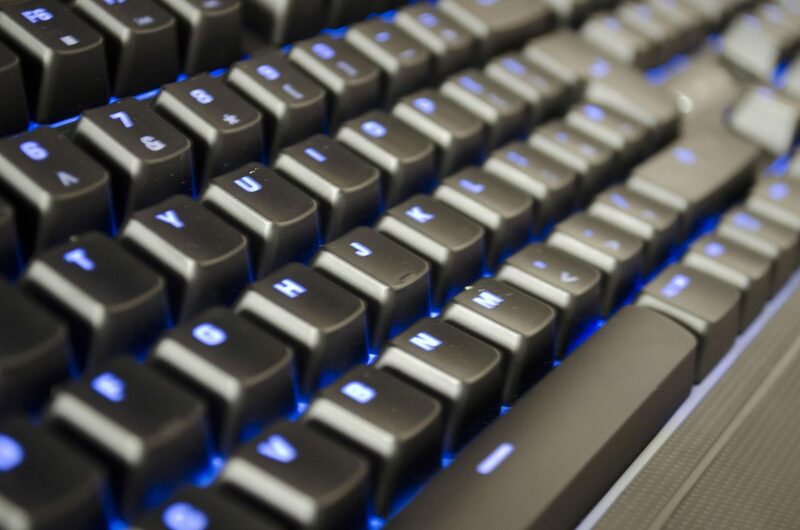 The Ryos MK FX features Cherry Brown Mechanical switches and a per-key RGB LED Illumination backlighting. The fun doesn’t stop there though, ROCCAT is known for their innovation and pushing the boundaries on gaming peripherals so there are plenty of more awesome features we will cover shortly. 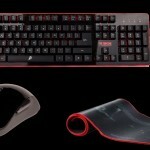 The Ryos MK FX is a full sized keyboard that comes with a non-detachable wrist rest which does make it rather large. 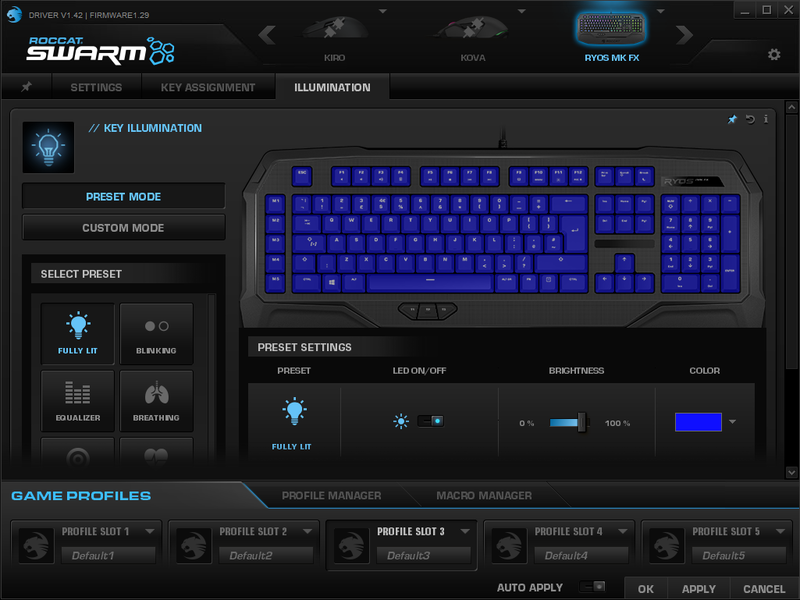 The Ryos MK FX can also be easily customized VIA the downloadable ROCCAT SWARM Software and has it’s own onboard CPU and Memory allowing it to offer amazing performance and even store your profiles directly to the keyboard. Before I give away to much, why don’t we take a quick look at the specifications and jump on into the closer look part of the review! The Ryos MK FX is a rather large keyboard. Not only does it feature a non-detachable wrist rest, it also has macro keys down the left-hand side and a few more features we will cover in a moment. There’s nothing wrong with a big keyboard just make sure you have the room for. 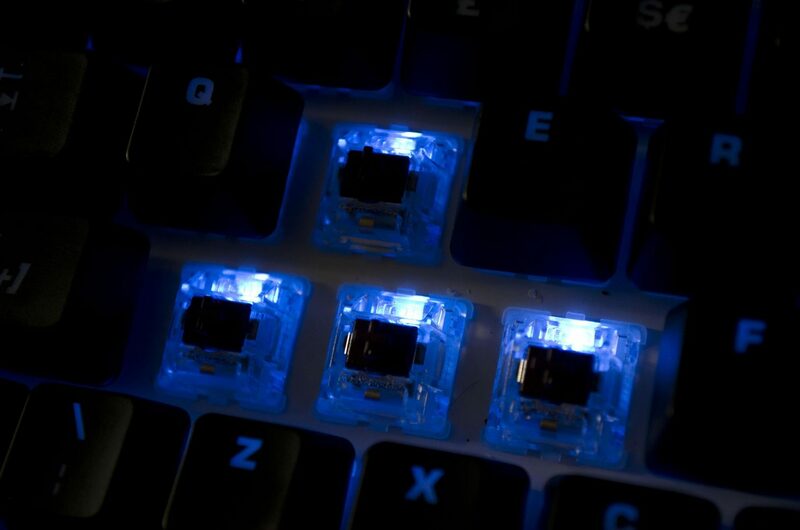 The keycaps are standard ABS and are laser etched to allow for the backlighting to shine through when turned on. 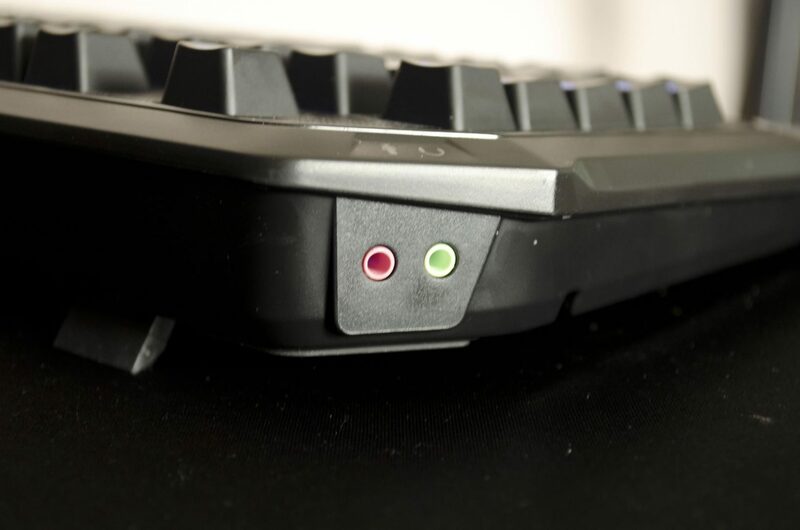 Another great feature that ROCCAT have implemented into their Ryos MK FX keyboard is the audio connections that can be found in the top left-hand corner. 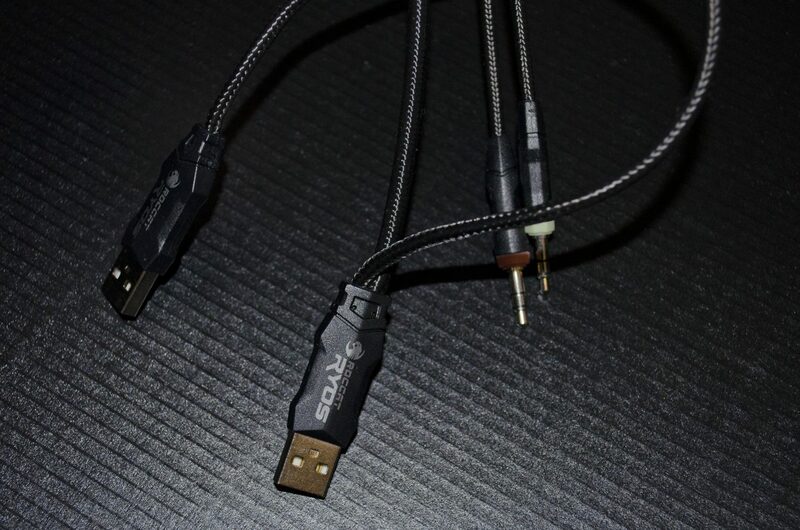 If desired, users will be able to connect the audio inputs cables from the keyboard into their motherboard or sound card and then plug their headset and mic into the keyboard itself. This will come in handy for those who may like to use their headset from time to time but not all the time as it will allow them to easily plug it into the keyboard rather than having to find and try to plug it into to the back of their PC. As you can see, the actual location of the inputs on the keyboard itself are placed as to not effect anything else should you choose not to use them. There are 2x audio cables that can be plugged into the PC so users can plug their headsets right into the keyboard itself. There are also 2x USB 3.0 plugs that will need to be plugged into to power up the keyboard and all of its LED lighting. 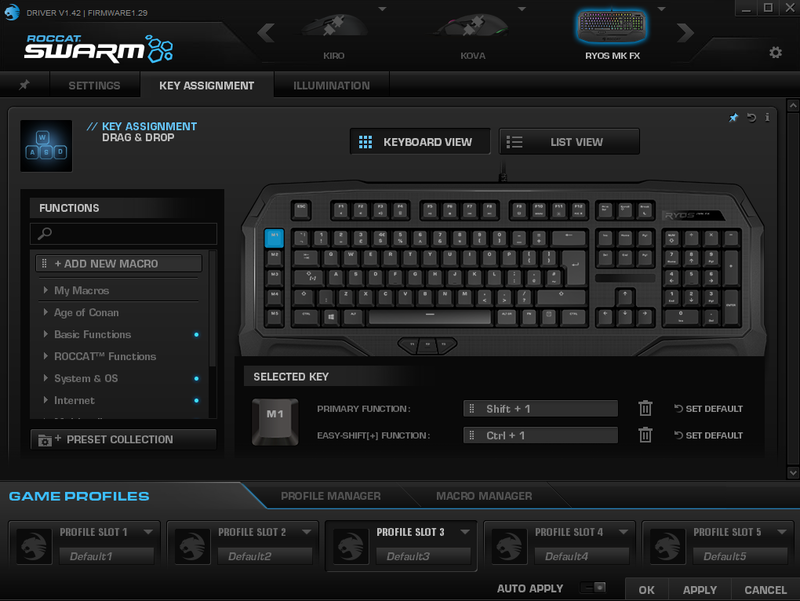 ROCCAT felt that users thumbs were to idle so they went ahead and added 3x thumbster keys as they call them. 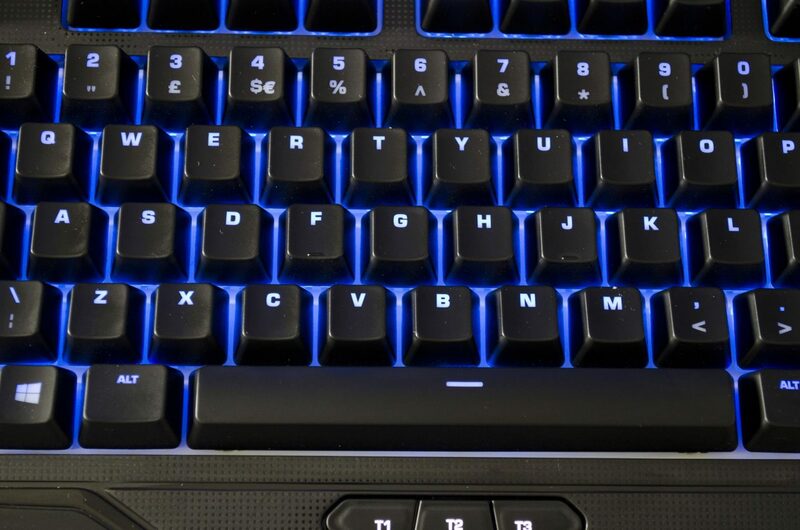 These keys can all have their own functions programmed to them and can be used for anything from setting a macro to changing the colour of the LED backlighting and everything in between. This is a great addition to a keyboard designed for gaming as you could use it to set different profiles for games and be able to switch between them at the click of a thumbster button! 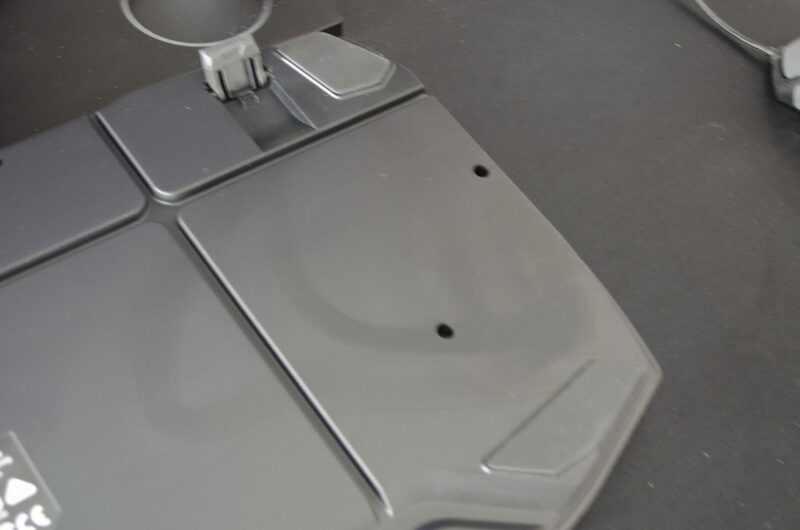 On the bottom of the Ryos MK FX, there are 5 anti-slip pads as well as two foldout feet. 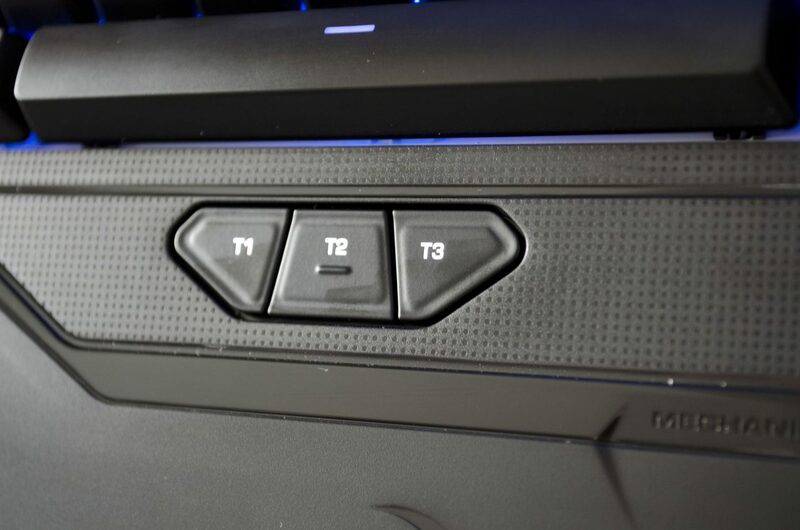 ROCCAT have also gone the extra mile on the bottom side and gave us a bit of a cable routeing/management area which will allow users to simply route the cable to their desired side of the keyboard. Each key features it’s own Cherry MX switch that is individually backlit.The Ryos MK FX does feature RGB keyboard so you can set each key to an individual colour of almost any colour of your choosing. Per my normal settings, I always set all the keys to blue. While I do like the backlighting very much, I prefer to have it set to a single colour most of the time. If you would like a better look at the LEDs and some of the functions they offer, please do watch the video above. The LED profiles start just before the 8-minute mark! As we can now see, each key has it’s own Cherry MX switch and in the case of the keyboard on review, they are brown switches. Cherry have made the casings of the switches clear to allow for the LED to shine through a bit brighter and easier. Cherry MX is the original mechanical switches and are the top-dog as far as mechanical switches are concerned. While some companies try to cut corners and use knock-off switches, it is nice to see ROCCAT has opted to use the Cherry MX switches, even if it does mean the Ryos MK FX carries a premium price tag. 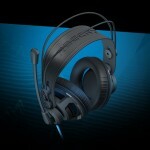 Before I talk about the performance, I want to mention the ROCCAT Easy Shift[+] Technology. 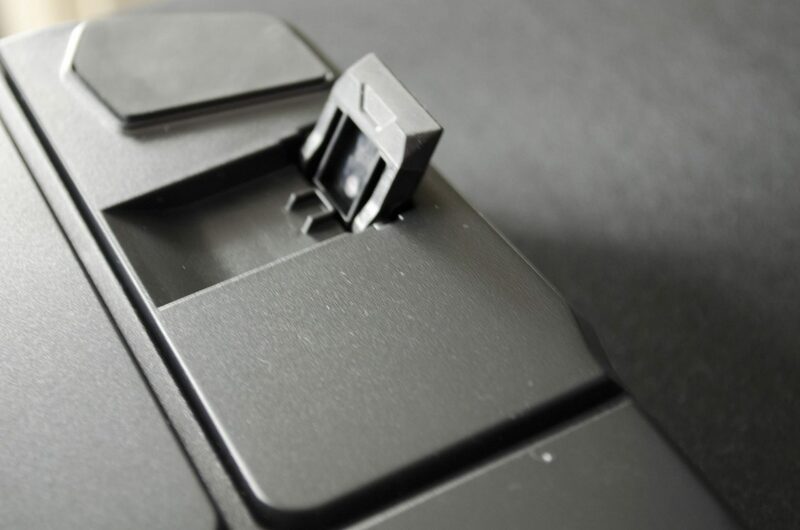 The Easy Shift Technology allows you to bind a second feature to ANY button on your ROCCAT keyboard or mouse. The Easy Shift button is where the Caps Lock button normally is and can be set up in the SWARM Software. To use, simply set it up and then hit the Easy Shift button and the key you have bound with a second function, it’s that simple. The Easy Shift button can be used for simple functions or the most demanding macros and will help to give you the power you need in the heat of battle. Using the Ryos MK FX to game on was amazing! The Cherry MX switches are truly tried and tested and never let down. 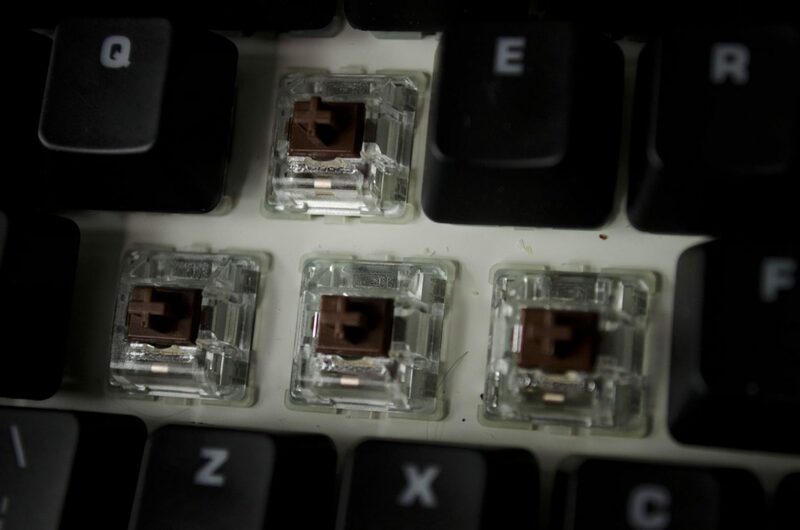 The brown variants of the Cherry switches are a great switch for gaming as they provide a nice non-clicky tactile feedback so you know when the key has been pressed properly. Switches aside, the Ryos MK FX is loaded with amazing features to help give you the edge over your opponents. One of the features I found most handy were the thumbster buttons. Alongside the macro keys, the thumbster buttons give users more options for the heat of battle. I am primarily an FPS player as most will know so I had them bound to grenades and any special functions, such as using the flame thrower in Black Ops 3 multiplayer which I normally have to hit Q for. I enjoyed being able to switch to the flamethrower in the middle of a gun fight without having to take my fingers of the main movement keys of w,a,s and d.
Overall, the Ryos MK FX never let me down when gaming. 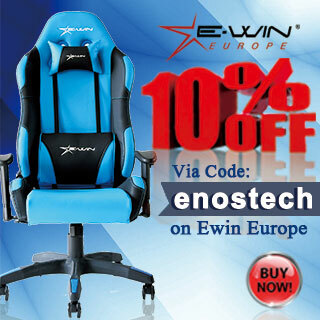 There are just so many features that allow you to get everything set just the way you want. One of which is a favourite of mine and is the disable windows key. This allows you to enter the disable key mode which literally does just that, disable keys for you. What’s even better is not only can you disable the windows keys, you can select from a few more keys to disable in the SWARM software. This is a must have gaming feature as the last thing you want to do during a game is accidently hit the windows key and have your game minimized on you, it will more time than not result in you losing one way or another. 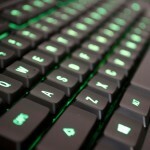 Gaming aside, the Ryos MK FX is a great keyboard. All those gaming features can be turned into real-world time-saving features. For instance, the Easy Shift Technology can help those who edit photos and/or videos a lot. The thumbster buttons can also have some nice functions bound to them, for instance, you could bind them to be, cut,copy and paste which I am sure most of us use on a daily basis. The possibilities for setting this keyboard up to your desired requirements is ridiculous as there really is just that many ways to customize it. The Ryos MK FX also features all of the standard FN+ plus keys that allow you to control things such as your media player simply by hitting the FN key and one of the F keys. The Cherry MX Brown switches featured in the Ryos MK FX offer a great middle ground in performance for both gaming and typing as the tactile feedback is handy for both. Also, the brown switches are non-clicky so they don’t make much noise and could even be suitable for an office environment. 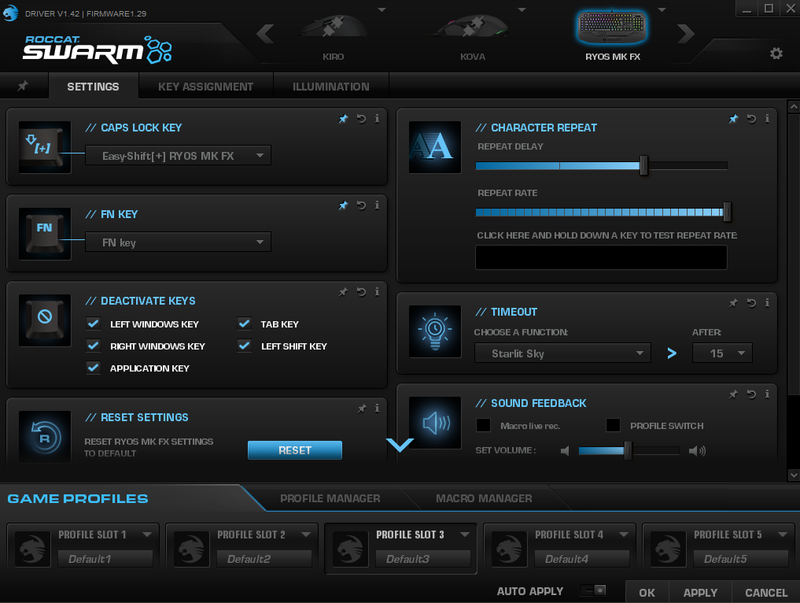 The ROCCAT SWARM is a great bit of software that allows you to set up and customize your Ryos MK FX or any other compatible ROCCAT product. As you will see below, you can choose from custom or preset mode, which there are quite a lot of preset options but if you don’t find what you need, you can also set it up yourself. The SWARM software will also allow you to set up all you binds and macros and thumbster keys and even the Easy Shift keys should that be something you are interested in. Oh, you want to customize your LED backlighting do you? Well then, open up SWARM and have at it. Not a fan of the Easy Shift button? Go ahead and set it back to be a standard Caps Lock button VIA the software. The SWARM software is one of the most extensive pieces of software I have seen for a keyboard as it does allow you to customize nearly every aspect of the keyboard with ease. 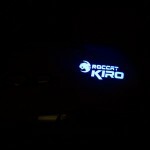 To say I enjoyed my time with the ROCCAT Ryos MK FX would be an understatement. Although quite large, the Ryos MK FX is chalk full of amazing and useful features that make it a great top of the line mechanical keyboard. There is no denying this beast is designed for gaming, everything about it screams gaming from the looks to all the customization options. 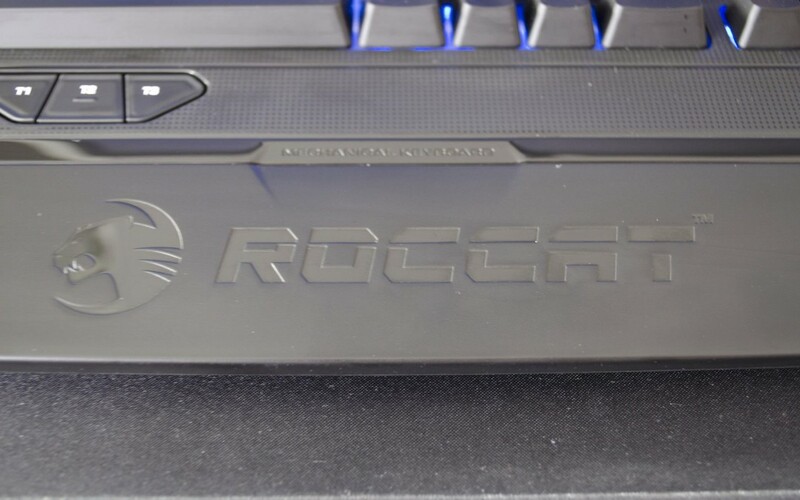 Roccat has really outdone themselves and they added in some RGB LEDs just for good measure. I could ramble on and on about how nice the keyboard is but let’s go ahead and have a quick recap. ROCCAT went with the Cherry MX switches so right out of the gate, we already knew they performance was going to mostly be on point. 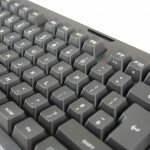 Cherry are known for having the best mechanical switches on the market and they have not let us down yet. Switches aside, the Ryos MK FX can make use of the SWARM software engine which allows the most customization and users options I have ever seen. There are thumbster and macro buttons so no matter what genre of game you play, the Ryos MK FX will have you covered. Let us also not forget about the Easy Shift technology that allows every key to seamlessly have a secondary function. All in all, it is hard to offer better performance than what the Ryos MK FX brings to the table. 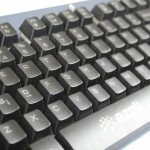 The Ryos MK FX is a big keyboard that features thick and durable plastic and a nice braided cable. There are so many features packed onto this board it is amazing and what’s even better is that ROCCAT has done it all tastefully. 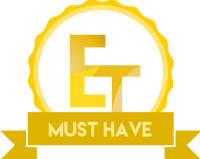 Nothing is over the top, or in your face, it is just there and offers great functionality. The non-detachable wrist rest can be a gift or a curse depending on each user’s own needs though it does help to add some amazing function to the board, if only for the thumbster buttons. Taking a look at the general aesthetics of the board and overall function it has to offer, it is easy to understand why ROCCAT went with the top-grade Cherry MX mechanical switches. 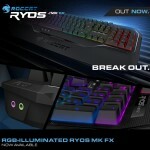 Simply put, to be the best, you have to use the best components and that is what ROCCAT has done with the RYOS MK FX. 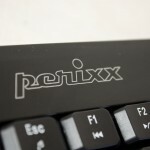 This is what is going to put most people off from this keyboard, the price. 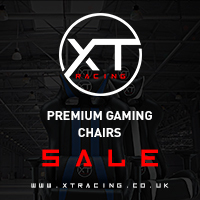 Coming in at £140 here in the UK you are actually still getting amazing value for money, even if it is a bit expensive. The Ryos MK FX offers more functions than that of any other keyboard I have ever personally used or tested and it does it with class and style. The customization options available VIA the SWARM software alone are worth their weight in gold. 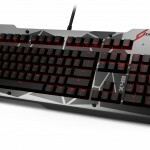 The Ryos MK FX is definitely a top of the line gaming keyboard and while there may be others out there, I haven’t seen any that offer quite as much as the Ryos MK FX does. While the Ryos MK FX may be the biggest keyboard I have ever had the pleasure to use, thanks in part to its wrist rest, it always offers more functions and customization than any other keyboard I have used. ROCCAT have done an amazing job all around with the Ryos MK FX and it is definitely one of the best keyboards on the market hands down. dependent on personal tastes of course! 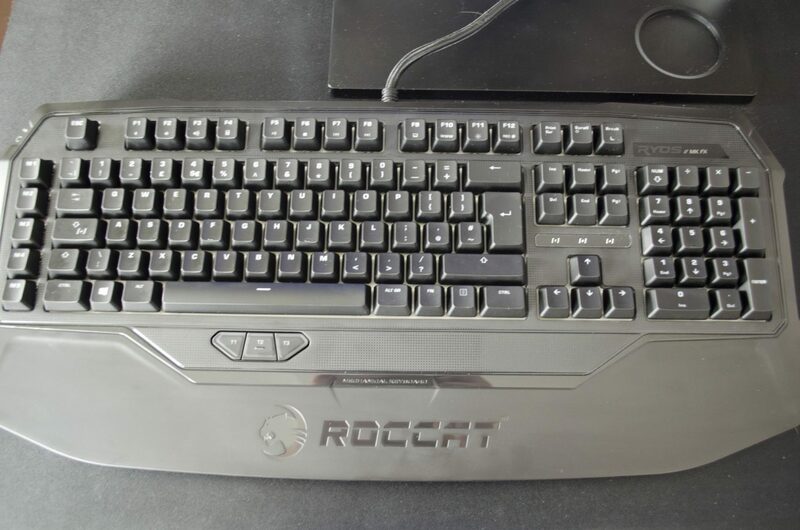 I would like to thank ROCCAT for sending in their Ryos MK FX Mechanical Keyboard for review.